Bring a large skillet sprayed with nonstick spray to medium-high heat. Add beef, pepper, and 1/8 tsp. salt. Cook and crumble until browned, about 3 minutes. Add onion and mushrooms. Cook, stir, and crumble until beef is fully cooked and veggies are soft, about 4 minutes. Add crushed tomatoes, Italian seasoning, and 1 tsp. garlic. Cook and stir until well mixed, about 1 minute. In a medium bowl, combine spinach, ricotta cheese, egg whites/substitute, nutmeg, remaining 1/8 tsp. salt, and remaining 1/2 tsp. garlic. Mix well. Press a wonton wrapper into the bottom and up along the sides of each cup of the pan. Evenly distribute half of the spinach-ricotta mixture among the cups (about 1 1/2 tbsp. each), and smooth out the surfaces. Top with half of the beef mixture (about 2 tbsp. each), and smooth out the surfaces. Top with half of the mozzarella cheese (1 tbsp. each). Place another wonton wrapper into each cup, lightly pressing it down and along the sides, letting the edges fall over the pan. Repeat layering with remaining spinach-ricotta mixture, beef mixture, and mozzarella cheese. Bake until spinach-ricotta mixture is hot, mozzarella has melted, and wrapper edges have browned, 10 - 12 minutes. 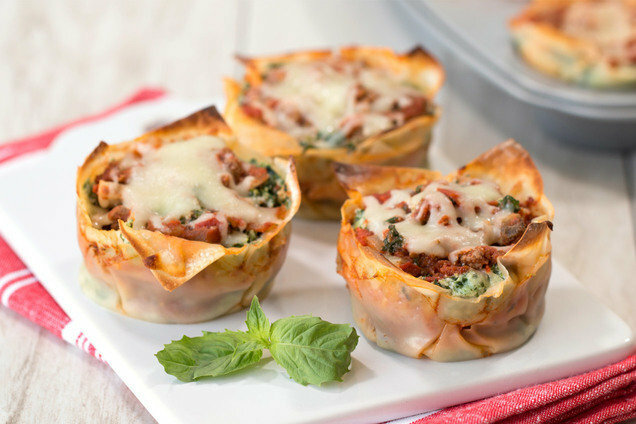 You probably know at least 12 people who would flip over these lasagnas -- click "Send to a Friend" now!